NetBeans is an open-source, Java-based integrated development environment (IDE) that allows developers to create mobile, desktop, and web applications. It’s a free IDE that parades integrated support for developing with multiple languages including Java, CSS, PHP, HTML, and C++. The software adopts a modular architecture with a great set of tools that aid the entire development cycle right from project inception to app deployment. Nearly every function in NetBeans happens through modules designed to power and extend all its capabilities. The cross-platform architecture means that this IDE can impeccably run on Windows, OS X, Linux, and other UNIX based Operating systems. 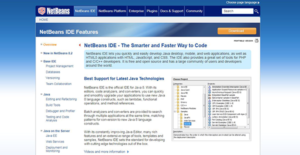 NetBeans is the official IDE for Java 8 with powerful code analyzers, converters, and editors. In addition, the solution has a worldwide community of active users and developers. NetBeans is designed to offer a smart and fast way for developers to code. The application provides robust code analyzers, converters, and editors that display support for the latest Java technologies. The features allow developers to quickly and effortlessly upgrade applications to use the cutting-edge Java 8 language constructs. NetBeans enables smooth and fast code editing. The code editor provides powerful tools, code templates, code generators, and coding tips that enable developers to refactor code easily. It supports multiple languages and can easily be extended via plugins to facilitate extra functionality. The editor works in tandem with the Drag and drop tools to allow the smart development of GUIs for Java EE, PHP, Java SE, C/C++, HTML5, and Java ME. The GUI builder is intuitive and easy to use; developers can seamlessly prototype GUIs live even at customer presentations. The static analysis tools enable users to cut the expense of buggy code. In addition, NetBeans integrates with the popular FindBugs tool to empower users to identify and fix common Java code problems. The NetBeans Profiler offers professional assistance to developers helping them optimize memory usage and application speed. It assists users to create scalable and reliable JavaFX, Java SE, and Java EE applications. If you are considering NetBeans it might also be beneficial to check out other subcategories of Best IDE Software listed in our base of B2B software reviews. Each enterprise has different needs and needs an application that can be customized for their size, kind of staff members and clients, and the particular industry they are in. For these reasons, no system can proffer perfect tools off-the-shelf. When you look for a software product, first be sure what you require it for. Read some NetBeans reviews and ask yourself do you need basic features or do you need sophisticated tools? Are there any industry-specific functionalities that you are searching for? Find the answers to these queries to assist your search. There are lots of aspects that you need to reflect on and these include your budget, specific business wants, your company size, integration needs etc. Take your time, check out a few free trials, and finally zero in on the app that offers all that you need to enhance your company effectiveness and productivity. How Much Does NetBeans Cost? NetBeans is a free IDE there are no enterprise pricing plans. We realize that when you make a decision to buy IDE Software it’s important not only to see how experts evaluate it in their reviews, but also to find out if the real people and companies that buy it are actually satisfied with the product. That’s why we’ve created our behavior-based Customer Satisfaction Algorithm™ that gathers customer reviews, comments and NetBeans reviews across a wide range of social media sites. The data is then presented in an easy to digest form showing how many people had positive and negative experience with NetBeans. With that information at hand you should be equipped to make an informed buying decision that you won’t regret. What are NetBeans pricing details? What integrations are available for NetBeans?